Supervision is a prerequisite for all counsellors, and for most psychotherapists, yet until recently it has been assumed that any experienced counsellor or therapist could become a supervisor without any special expertise. But the experience of those in supervision is sometimes of inadequate or even unhelpful work by their supervisors. At the same time supervision is receiving considerable attention as a discipline in its own right, with an expanding literature on the dynamics of the supervisory couple (or the supervisory triad, since the client is a central if absent presence); more attention is also being paid to the technical skills required of the supervisor. 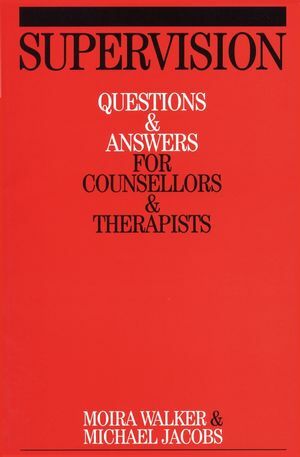 This book addresses those issues both from the perspective of the supervisee and the supervisor, suggesting what supervisees might expect from good supervision, as well as offering guidance to supervisors on how best to use to the full the opportunities offered by a therapeutic situation which has some similarities, but also some radical differences from counselling and therapy itself. Moira Walker is the author of Supervision: Questions and Answers for Counsellors and Therapists, published by Wiley. Michael Jacobs is the author of Supervision: Questions and Answers for Counsellors and Therapists, published by Wiley. Chapter 1 The supervisee: initial questions. Chapter 2 The supervisee: further issues. Chapter 3 The supervisor: intial questions. Chapter 4 The supervisor: further issues.